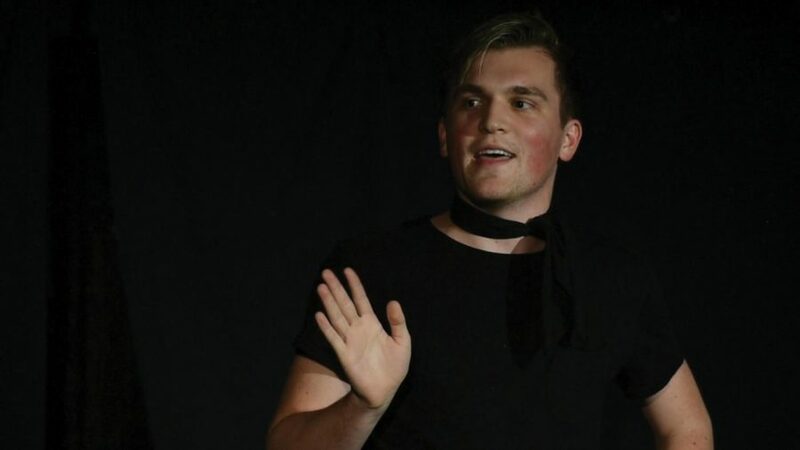 Among cheers, laughter and howls, Communication senior Chris Lanham delivered his stand up routine clad in black high heels. As one of eight participants at Friday’s “Bring it Home to You” art event, Lanham delivered a sketch narrative based on his experience with his sexuality. “Bring it Home to You,” hosted by theater board Vertigo Productions at Shanley Pavilion, provided artists with an opportunity to showcase what home meant to them. Participants had a mere 24 hours to produce and submit art once they got a prompt that was related to home — a constraint event co-producer and Vertigo publicity chair Susie McCollum said “heightened” material. Lanham said the time constraint challenged him to accelerate his writing process — he worried less about the quality of his jokes, instead using word associations to brainstorm material. Since most stand-up comics typically refine their material over time by testing it out on audiences, he said he felt more nervous than normal about his entirely new set of jokes. As participants entered Shanley, they picked up plates and got macaroni and cheese from two artists roleplaying as grandparents inviting people into their “home.” Audience members then wrote what reminded them of home on Post-it notes — phrases like “long drives,” “ghosts” and “Morton Shapiro” — which they placed on Shanley’s support beams. During the event, the audience witnessed plays and songs, roaring with laughter at times but was also stunned by raw emotion at others. Vertigo began planning “Bring it Home to You” last spring quarter, looking to host an accessible, low-key event that wouldn’t require a lot of commitment from artists and audience members, McCollum said. McCollum said they chose “home” as the central theme because it would be fresh in people’s minds as the academic year started. More than that, McCollum said it would be something everyone could understand and relate to.